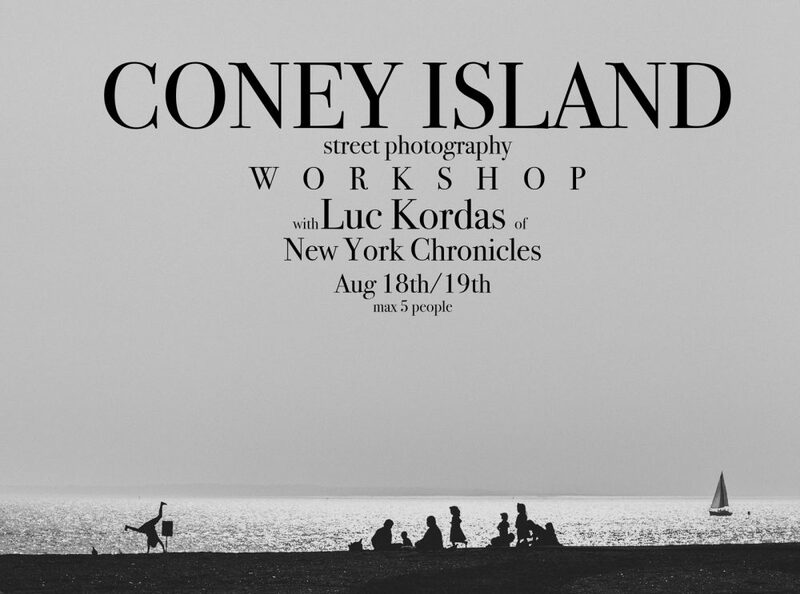 This summer documentary and street photographer Luc Kordas, author of New York Chronicles, resident of Coney Island, invites you for a weekend workshop at one of the most iconic spots of the United States and certainly the most renowned beach when it comes to street photography. Virtually all of the New York legends of street photography shot at Coney Island at some point, some of them coming back regularly for decades. For over a century, Coney Island has provided New Yorkers with an escape from the bustle of the city—be that a glittering 19th-century resort or a gritty beachside amusement park. From the boardwalk and iconic rides like the Cyclone and the parachute jump to Nathan’s Famous Hot Dogs, Coney Island is a place of endless possibility—located, conveniently, a subway ride away for most New Yorkers. Coney Island’s diverse crowd and myriad traditions, from sideshow acts to the Mermaid Parade, make it a fascinating site like no other. So it’s only natural that photographers have continuously flocked to the beach—not to play, but to work. Coney Island is at its best in the summer! The crowds, the hot weather and the weekend vibes make for a fantastic playground for photographers. This 2-day intensive workshop will be centered around full days of shooting in Coney Island as well as the discussion, analysis, and critique of photographs. I will be looking to guide you in making compelling photographs, whether that be on the boardwalk, beach, streets or elsewhere. Friday (optional) (8pm-10pm): As a warm-up, join Luc to shoot fireworks show to practice and learn about night street photography. Saturday (9am-7pm): Introduction, portfolio review and a lecture from Luc, then shoot all day until sunset. Sunday (9am-9pm): Meet in classroom for critique in the morning, then spend rest of day out shooting, then back to classroom for editing, critique and final thoughts. Our meeting points and classroom space are located in Coney Island 2 blocks away from the boardwalk. A detailed itinerary will be sent to you after signing up. Workshops are limited to 5 participants only! Cancellation Policy: Cancellations made 20 days or more before workshop begins will receive a 100% refund. Cancellations made between 19 and 8 days before workshop will receive a 50% refund. Cancellations made 7 days or less before workshop will receive no refund. Luc cannot be responsible for travel/accommodation fees in the event of any cancellation. It is recommended you book refundable travel arrangements. Cameras will not be provided. A laptop will be needed for downloading images from your camera to edit and review. Luc will not be held liable for any damages or injuries.